I am receiving the error "The browser based authentication dialog failed to complete. Reason: the server or proxy was not found" when I try to connect Azure AD powershell command. This issue may occur if your proxy server not allowing to connect internet (especially login portal: https://login.microsoftonline.com) or the proxy settings may not be configured properly to connect internet. 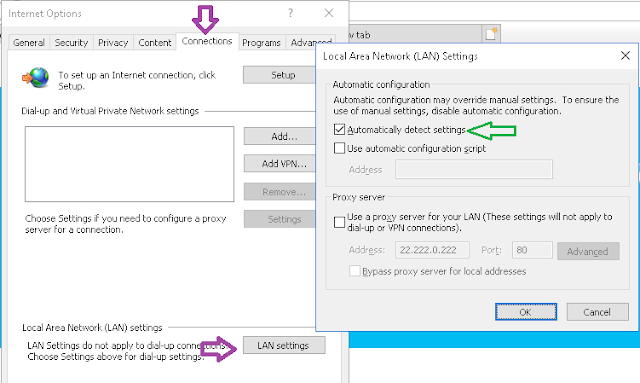 Open Internet Explorer (with Run as administrator privilege)-> click Settings (gear icon) in top-right corner -> Internet Options -> select Connections tab -> LAN Settings -> set Automatically detect settings and remove Proxy settings if configured.